Structural properties of proteins in mixtures. We study how the presence of cosolvents can affect protein stability and in particular we developed a method able to quantify the composition of protein solvation shell in a mixture at finite protein concentration. We study the relevance of different chemical-physical parameters on protein-protein interactions in solution. In particular we investigated the effect of ionic strength, cosolvents, temperature and high pressure. Very recently we have focused on protein interactions in the first stages of amiloidogenesis. Prediction of protein structures via Small Angle Scattering techniques and via new bioinformatics approaches. 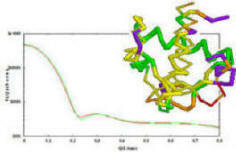 We are developing new SAXS methods for evaluating candidate models in protein structure prediction. Structural properties and interactions in quadruplexes of guanosine. 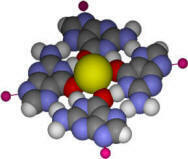 We study the self assembly phenomena that occur in guanosine 5' -monophosphate and its derivatives in solution. In particular in recent years our research in this field has been focused on the role of monovalent cations in the formation and stabilisation of the self aggregates. Structure and stability of lyotropic lipidic phases. We investigate the effect of concentration, ionic strength, cosolvents, temperature and high pressure on the energetics and phase behavior of lipid mesophases. We study the effects of protein fibrillar and pre-fibrillar aggregates of cytochrome c on Giant Unilamellar Vesicles (GUVs), used as model cellular membranes. We used 1-palmitoyl-2-oleoyl-sn-glycero-3-phosphocholine (POPC) to produce 50-300 µm diameter GUVs by electroformation, using an alternating voltage (V = 1.5V, f = 10Hz). 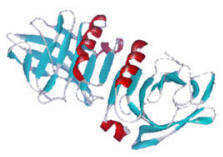 Cytochrome c amyloidogenesis was induced by ageing at high temperature (60-70°C). GUVs proved to be a useful and versatile tool to study structural and thermodynamic properties of lipid membranes and their interaction with biological compounds. Also, the presence of cholesterol in phospholipidic bilayers alters vesicles fluidity and gives rise to peculiar shape transitions known as budding and pearling, as illustrated in the videos.